Princeton University Press, 9780691157665, 125pp. 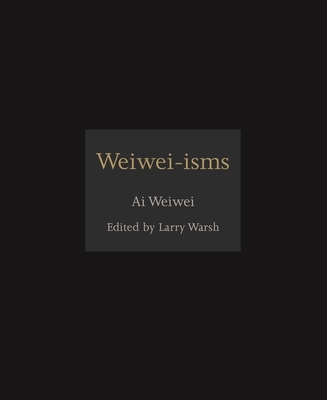 This collection of quotes demonstrates the elegant simplicity of Ai Weiwei's thoughts on key aspects of his art, politics, and life. A master at communicating powerful ideas in astonishingly few words, Ai Weiwei is known for his innovative use of social media to disseminate his views. The short quotations presented here have been carefully selected from articles, tweets, and interviews given by this acclaimed Chinese artist and activist. The book is organized into six categories: freedom of expression; art and activism; government, power, and moral choices; the digital world; history, the historical moment, and the future; and personal reflections. "Say what you need to say plainly, and then take responsibility for it." "A small act is worth a million thoughts." "Liberty is about our rights to question everything." "Everything is art. Everything is politics." "The art always wins. Anything can happen to me, but the art will stay." "Life is art. Art is life. I never separate it. I don't feel that much anger. I equally have a lot of joy." "Once you've tasted freedom, it stays in your heart and no one can take it. Then, you can be more powerful than a whole country." "I feel powerless all the time, but I regain my energy by making a very small difference that won't cost me much." "Tips on surviving the regime: Respect yourself and speak for others. Do one small thing every day to prove the existence of justice." "Only with the Internet can a peasant I have never met hear my voice and I can learn what's on his mind. A fairy tale has come true." "The Internet is uncontrollable. And if the Internet is uncontrollable, freedom will win. It's as simple as that." "The Internet is the best thing that could have happened to China." "I've never planned any part of my career-- except being an artist. And I was pushed into that corner because I thought being an artist was the only way to have a little freedom." "Anyone fighting for freedom does not want to totally lose their freedom." "Expressing oneself is like a drug. I'm so addicted to it." Ai Weiwei is one of China's most influential and inspiring figures. Artist, architect, curator, and activist, he has been an outspoken critic of the Chinese government's stance on human rights and democracy. His work has been exhibited at the Venice Biennale, the Guangzhou Triennial, Tate Modern, the Smithsonian, and other venues throughout the world. Larry Warsh has been active in the art world for more than thirty years. He has collaborated with Ai Weiwei on several projects, including the public art installation Circle of Animals / Zodiac Heads (2010). Warsh is a former member of the Contemporary Arts Council of the Asia Society and the Contemporary Arts Committee of the China Institute. He has also served on the boards of the Museum of Contemporary Art, China; the Alliance for the Arts; and the Getty Museum Photographs Council. He is currently on the board of Muse Film and Television and is a member of the Basquiat Authentication Committee.